After spending our 2010-2011 conference season handing out OpenSesame hoodies at DevLearn, ASTD TechKnowledge, Learning Solutions, the CLO Symposium, ASTD International Conference & Expo and eLearning DevCon, we decided it was time to find out where those hoodies had spent their summer. It turns out some of them have been eating pretzels. And some have been napping. And others have been to the beach. Or to the World Series of Poker, in Las Vegas. But after a challenging, brutal, argumentative meeting of the OpenSesame executive team, our winner is the majesty of the great outdoors. Here’s Judy Unrein, at Smith Rock, showing us how Mother Nature does it. Congratulations, Judy! The iPad will be on its way. Thanks so much to all the entrants! We had a wonderful time seeing the entries come in. Have a glorious summer. 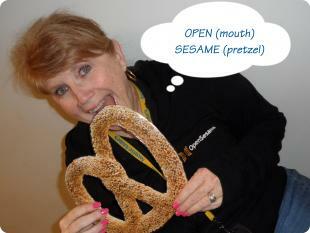 The OpenSesame crew will hit the road again this fall, visiting the Enterprise Learning! Conference & Expo, the Chief Learning Officer Fall Symposium and (of course) DevLearn. We’ll bring our hoodies and be ready to work with you to unlock elearning!